A strong increase in U.S. visitors in October, mostly attendees of the American Dental Association convention, more than wiped out a decrease in Japanese arrivals and made it a record October for isle tourism, state figures show. Westbound arrivals last month, mostly from the mainland but also including Canadians and Europeans, were up 11 percent from the previous October, for a total of 388,240, compared with 349,910 in October 1998. Eastbound arrivals, led by the Japanese but including those from other Asia-Pacific points, were down 2.1 percent for a total of 175,390, compared with 179,090 in the year-earlier month. 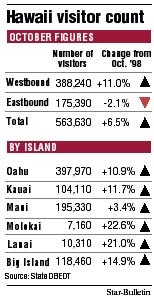 But the westbound gain was more than 10 times the 3,700 decline in Eastbound arrivals. The end result was a total October visitor count of 563,630, up 6.5 percent from 529,000 in October 1998. "The October statistics clearly provide the first quantifiable evidence that conventions have a strong impact on the visitor industry and Hawaii's economy," said Seiji Naya, director of the Department of Business, Economic Development & Tourism which issued the visitor report yesterday. Among the westbound visitors last month, 55,570 said they were here for conventions, an 118.7 percent increase from 25,410 conventioneers in the previous October. The Hawaii Visitors & Convention Bureau has estimated that 30,000 people came to the islands for the ADA convention Oct. 9-12, the biggest meeting so far at the Hawaii Convention Center. While state tax collection figures are not yet complete enough to confirm it, the HVCB has estimated that the ADA meeting brought $80 million into Hawaii. Westbound arrivals have been strong all year and the convention gave them an extra boost. The decline in arrivals from Japan was part of a continuing pattern, about the same as the Japanese decline in September. Japanese arrivals were down by 4.2 percent last month, at 134,170 compared with 140,000 in October 1998. Other Asia-Pacific countries increased their traffic to Hawaii, easing the impact of the Japanese decline. Not only were there more visitors overall last month, they stayed a little longer than those who came to the islands in October 1998. The average length of stay last month rose to 8.51 days vs. 8.47 days a year ago. Helped by post-convention vacations by the dentists' group, all islands showed higher October tourist traffic compared with a year earlier.